Welcome to MADDALEX DESIGNS...a hip, stylish and distinctive jewelry collection by Erica Potholm...always on trend! Our website represents a very small sample of designs available. To view the full collection, including Erica's newest creations, be sure to check out one of her upcoming events. 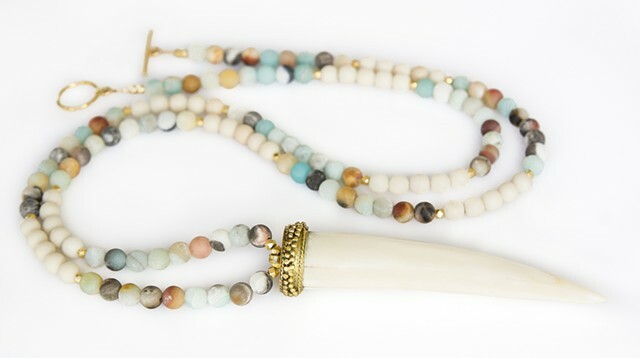 In 2017, Erica expanded her collection to include gorgeous silk and suede tassels, horn tusks and arrowheads, and earthy matte gemstones. Her latest collection (Fall/Winter 2017) features fun and fabulous genuine leather cuffs and earrings. To view the new collection, be sure to stop by the retail boutique of AR Workshop in Old Town Alexandria (located at 107 N. Fairfax Street). Custom orders are always welcome. To learn how Erica can create a special and unique piece for you, please contact us! PLEASE NOTE - OUR WEBSITE IS UNDERGOING MAINTENANCE. WE APOLOGIZE FOR THE INCONVENIENCE, BUT EXCITING THINGS ARE UNDERWAY!